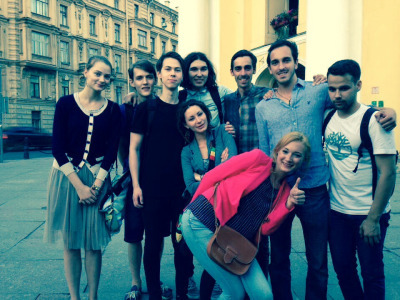 When we first opted for the Vodkatrain trip the main luring point was the chance to visit Saint Petersburg. 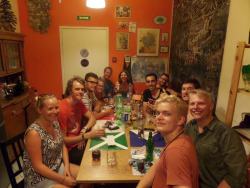 The Vodkatrain package offers a two night stop in the city but as we were making our own way across Europe instead of flying directly to Russia we decided to extend our visit to six days. This gave us ample time to explore the major sights. The magnificent State Hermitage Museum (also known as the winter palace) is a decadent delight with it’s hundreds of beautifully designed rooms full of thousands of artefacts ranging from ancient oddities to famous artwork truly leaves you feeling awe inspired and wanting to never visit another museum again. If you visit pre-book the tickets online and arrive for opening hours to allow for a whole day of exploration. Another famous sight was the Church of the Resurrection. The Orthodox Cathedral is hard to miss with its multicoloured towers. Inside this unique cathedral visitors are left astonished by a colourful plethora of wall to wall mosaic images of orthodox religious events all “modestly” famed in gold leaf. This feat of architecture is even more impressive when you learn that much of the church was destroyed by a shell fire in WW2 and has been painstakingly restored to its former glory. 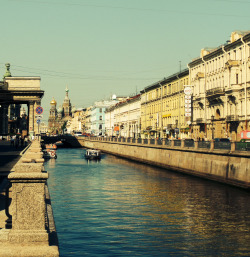 If you visit Saint Petersburg you must take a boat tour along the canals and onto the Neva river. The cruise is a great way to get your bearings and grab a fantastic view and photo opportunity from the river. The tour covers views of most of the main sights including the Winter Palace, Peter and Paul Fortress, Admiralty Headquarters, Cruiser Aurora, Marble Palace and Kunstkamera. Plus if you buy a few tins of booze before hand it’s a great opportunity to relax and enjoy the view. 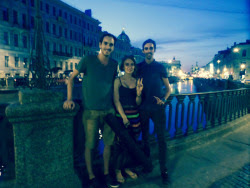 During our stay in Saint Petersburg we met up with our friend Dina who we met in Budva a month or so previous. Dina along with her friend Adrianna were kind enough to guide us on the river cruise as we jumped on the Russian tour and invite us out around the local pubs and bars. By chance it coincided with a Russian holiday celebrating the countries paratrooper regiment. It’s basically an excuse for people from the regiment to get totally pissed and all over the city scary Russian men wearing their blue uniforms walk from pub to pub waving flags, drinking, driving like nutters and acting aggressively (more so towards the evening). The experience was great although you had to watch out for the crazy drivers as over the course of a night we saw many accidents. We stayed out until 7 am and although we wrote off one morning through sleep it was definitely worth it to enjoy a few too many beers and vodkas with a good friend. A special mention must also be made to our friendly couchsurfer guide Anna who was kind enough to give us a guided tour of the city on our penultimate evening. Many of the city tourist sights were sadly closed but it is always nice making new friends. Saint Petersburg definitely surpassed our expectations and Jono and I definitely would take up a chance to visit again to see the sights we failed to visit, venture around the city suburbs and visit surrounding towns.